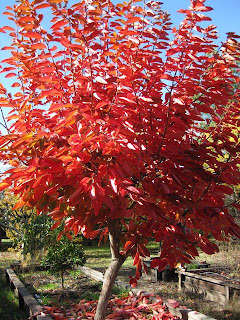 California's Central Valley is ablaze with the other orange fruit tree currently: the brightly colored persimmon. And it's not just the fruit. Persimmon tree leaves can turn a brilliant hue of red before the first big wind and rain storm of late November washes them off their branches. What's left behind is the unpicked fruit, dangling like holiday ornaments during December. That's a feast for our eyes...as well as a banquet for hungry birds. Persimmons have adapted well to our California climate: warm, dry summers and mild winters. 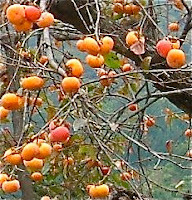 At least 500 different Japanese persimmon (Diospyros kaki) varieties were brought to California during a major planting spree from 1870 to 1920. In 1877 alone, more than 5,000 plants in 19 varieties were imported from Japan. 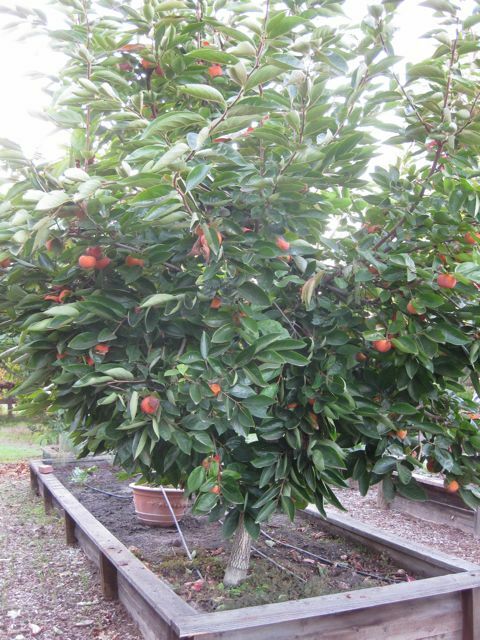 As a result, 99% of the commercial persimmon crop is grown here in California. Persimmons are quite nutritious, as well, loaded with Vitamin A, Vitamin C, Fiber, and antioxidants such as Beta-Carotene and Lycopene. If you live in the Central Valley, Southern California, Bay Area or low foothills ... you can grow that! 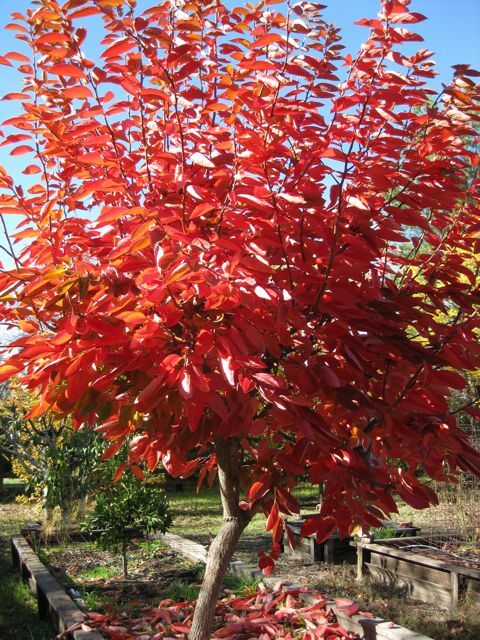 Bare root persimmon trees will be available at local nurseries during late December, January and February. Give them full sun and a regular irrigation in the dry months for best production. Persimmon trees can tolerate partial shade. Persimmons are usually classified as either astringent or non-astringent. For fresh eating straight from the tree, choose a non-astringent, self-pollinating variety such as Fuyu, Giant Fuyu, Yemon or Izu. Astrigent varieties, which need to soften thoroughly before they sweeten, include Hachiya, Chocolate or Tamopan. Those varieties are self-fruitful, as well. Location: Full sun with some air movement is recommended for persimmon trees in inland areas, although they will tolerate some partial shade. Persimmons grown in cooler areas should have full sun with protection from cooling breezes. As an attractive ornamental the tree fits well in the landscape. It does not compete well with eucalyptus. Soil: Persimmons can withstand a wide rage of conditions as long as the soil is not overly salty, but does best in deep, well drained loam. A pH range of 6.5 to 7.5 is preferred. The tree has a strong tap root which may mean digging a deeper hole than usual when planting (when on D. kaki stock). Irrigation: Persimmon trees will withstand short periods of drought, but the fruit will be larger and of higher quality with regular watering. Extreme drought will cause the leaves and fruit to drop prematurely. Any fruit left on the tree will probably sunburn. Some 36 to 48 inches of water are needed annually, applied gradually in spring and tapering off in the fall. Hot inland areas may require 2 or 3 applications weekly, while coastal areas may need watering only once every 6 weeks, depending on the soil. 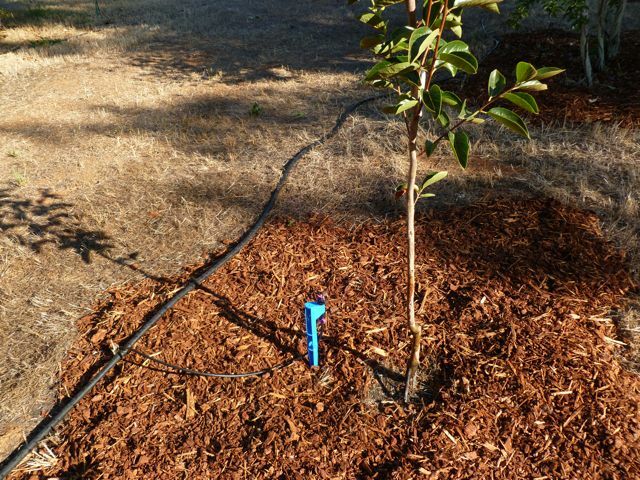 If a drip system is is used, the emitters should be moved away from the trunk as the tree matures. 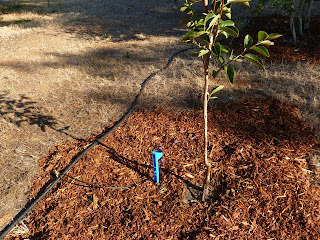 Fertilization: Most trees do well with a minimum of fertilizing. Excess nitrogen can cause fruit drop. If mature leaves are not deep green and shoot growth is less than a foot per year, apply a balanced fertilizer such as a 10-10-10 at a rate of 1 pound per inch of trunk diameter at ground level. Spread the fertilizer evenly under the canopy in late winter or early spring. Pruning: Prune persimmon trees to develop a strong framework of main branches while the tree is young. Otherwise the fruit, which is borne at the tips of the branches, may be too heavy and cause breakage. A regular program of removal of some new growth and heading others each year will improve structure and reduce alternate bearing. An open vase system is probably best. Even though the trees grow well on their own, persimmons can be pruned heavily as a hedge, as a screen, or to control size. They even make a nice espalier. Cut young trees back to 1/2 high (or about 3 feet) at the time of planting. Pests and Diseases: Persimmons are relatively problem-free, although mealybug and scale in association with ants can sometimes cause problems. Ant control will usually take care of these pests. Other occasional pests include white flies, thrips which can cause skin blemishes and a mite that is blamed for the "brown lace collar" near the calyx. Waterlogging can also cause root rot. Vertebrate pests such as squirrels, deer, coyotes, rats, opossums and birds are fond of the fruit and gophers will attack the roots. Other problems include blossom and young fruit shedding, especially on young trees. This is not usually a serious problem, but if the drop is excessive, it may be useful to try girdling a few branches. Over watering or over fertilization may also be responsible. Large quantities of small fruit on an otherwise healthy tree can be remedied by removing all but one or two fruit per twig in May or June. Harvest: Harvest astringent varieties when they are hard but fully colored. They will soften on the tree and improve in quality, but you will probably lose many fruit to the birds. 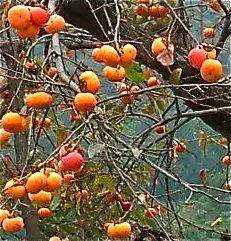 Astringent persimmons will ripen off the tree if stored at room temperature. Nonastringent persimmons are ready to harvest when they are fully colored, but for best flavor, allow them to soften slightly after harvest. 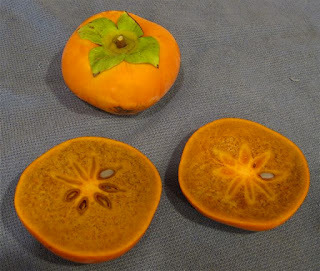 Both kinds of persimmons should be cut from the tree with hand-held pruning shears, leaving the calyx intact Unless the fruit is to be used for drying whole, the stems should be cut as close to the fruit as possible. Even though the fruit is relatively hard when harvested, it will bruise easily, so handle with care. Storage: Mature, hard astringent persimmons can be stored in the refrigerator for at least a month. They can also be frozen for 6 to 8 months. 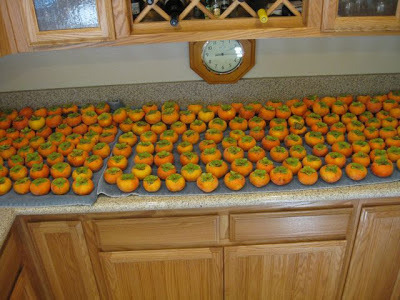 Nonastringent persimmons can be stored for a short period at room temperature. They will soften if kept with other fruit in the refrigerator. 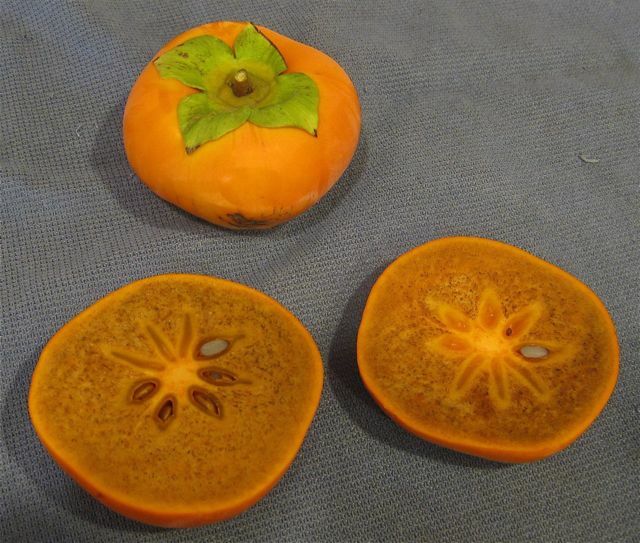 Persimmons also make an excellent dried fruit. They can either be peeled and dried whole or cut into slices (peeled or unpeeled) and dried that way. When firm astringent persimmons are peeled and dried whole they lose all their astringency and develop a sweet, datelike consistency. And we are in total agreement with the CRFG: persimmons make an excellent dried fruit, a great sweet snack or for use in cookies or breads! • Wash and remove the stem cap. Cut fruit in half and then into 3/8-1/2" slices. 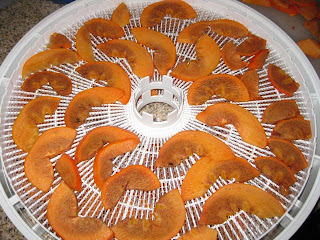 • Place on a dehydrator sheet in single layers. • Dry at 140 degrees for 1-2 hours, then reduce heat to 135 degrees for an additional 7 hours (approximate). • When done, they should be tender and pliable, but not sticky. At that point, you can either vacuum seal them in plastic bags for long term preservation, or store the dried persimmons in a canning jar for quick use. 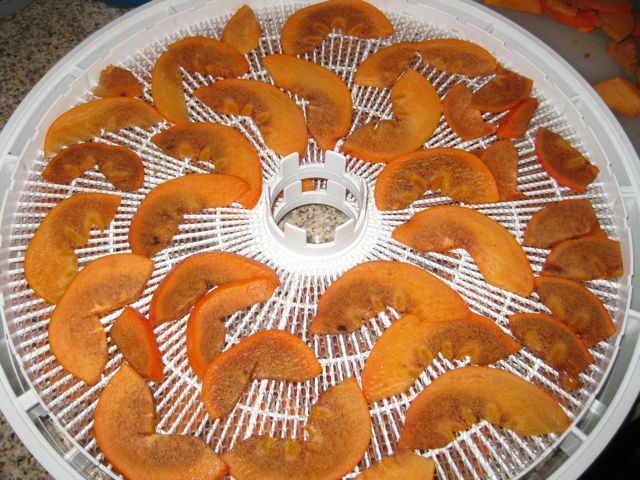 Backyard gardeners who do a lot of drying are passionate about their choice of dehydrators. Some prefer the rectangular Excalibur dehydrator ; others (including our household) enjoy the circular Nesco American Harvest Dehydrator . Our largest complaint about the Excalibur: the fan blows from the back to the front, which can rearrange any lightweight herb leaves that you might be trying to dry. The Nesco American Harvest dehydrator's fan moves warm air from the bottom up, offering less disturbance to the drying crops. Still, the Excalibur is a good choice for most fruit and vegetable drying. I dry them on a piece of stucco lath on top of the woodstove. Can also use hardware cloth. The woodstove itself is covered by floor tile leftovers. This is a very informative article Fred! Our tree is full of hachiya ready to harvest as soon as the storm blows through Shingletown. We always leave some for the birds. We dried lots of them last year both in the dehydrator and some we dried whole in the window hung by string, these we peeled first and they were delicious! And I so wish we could grow persimmons ita the north end of Puget Sound. Still, one Of the pleasures of You Can Grow That is living vicariously in each others macro and micro climates! Nice post and happy holidays! Persimmons are one of my favorite green smoothie ingredients. Chop up a persimmon and blend it with some Kale, Dandelion greens and cold spring water. Yep, that is a nice smoothie right there! Not something I can grow here, but I'm impressed with the yield off of one 7 foot tree. We grow apples and use a dehydrator for them. I really wish I had a garden like this to play with, that persimmon is so vividly red! National Fig Week? Homemade Fig Newtons! November Frosts, Freezes Ahead? Probably.